The attractive holiday home consists of a detached chalet, situated in a small-scale holiday park nearby the Eastern Scheldt and is suitable for 4 people. All the rooms in this holiday home are on the same floor and the house is surrounded by a large terrace, allowing you to enjoy the sun throughout the day. Your chalet offers nice views of the pond. 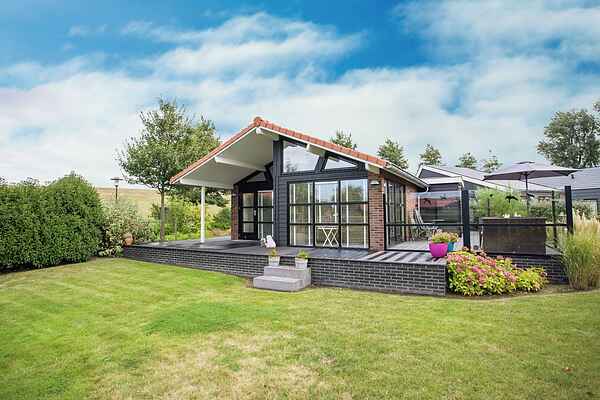 Your holiday home offers plenty of tranquility, space and luxury in a small scale holiday complex in Zeeland province, adjacent to the Eastern Scheldt National Park. From here, it only takes 10 minutes to the town centre of Goes and there are options for diving, golfing and cycling in the direct vicinity. There are also some nice walks along the Eastern Scheldt. The towns of Middelburg (32 km) and Bergen op Zoom (44 km) are worth a visit as well.